One of the teams I am working closely with is building a web-based tool for internal users to help them streamline their processes. We’ve been building this amazing product for about 15 weeks and it is looking really good now! I’ve only been working with this team for about a month. At our last retrospective we noted, with disappointment, that our stakeholders were becoming much less engaged during our Sprint Reviews and this worried us as we’re getting close to the end of the Alpha phase of the project. In particular, two of the stakeholders would stare with glazed eyes at the entire proceedings and we could tell they weren’t even listening to the developers demonstrating the new features. From the questions they asked you could tell the others were struggling. Also, even though we had given them access to the website in order to get stats on their usage and feedback, there was very little of both coming through (implicit or explicit). A couple of us got together to brainstorm possible solutions for getting them more engaged and we had a few ideas, some of which involved biscuits! We started off by banishing the idea of blaming our stakeholders for this non-engagement. We, instead, sought to look inwards at what WE could do to help them especially since we knew they were also very busy with work. We had no idea if we would succeed, but we thought to try all the same. We decided on 2 completed user stories that were simple enough for the stakeholders to demonstrate themselves and also that we wouldn’t warn them beforehand, just to spice things up a bit. At the start of the Sprint Review, I reminded the stakeholders present of the reason why we do these reviews (especially for the benefit of those who recently joined their team) and handed out a sticky note to each of them. I told them that two of the sticky notes had an X on them (the others had a Y) and the two lucky ones who got the X-marked stickies would be demonstrating stories to everyone else. We noticed straightaway that they sat up and were a lot more alert. What they didn’t know was that I had ‘rigged’ the handout of sticky notes so that the most engaged and the least engaged stakeholder would be the two random presenters! 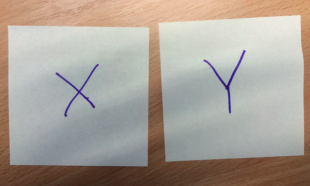 You can imagine the shock on the face of the latter stakeholder when they saw their sticky note marked with an X. In the initial part of the Sprint review, we showed them some of the work we’d done on analytics and application monitoring. After this we invited the more engaged stakeholder to demo the first story with the second being demo’ed by the other colleague afterwards. We could not have anticipated how successful this technique would be! First of all, the fact that the stakeholders realised they would have to demo some stories made them very alert and even for the stories that we demo’ed, the questions and suggestions were unending. Even the 2 least engaged stakeholders were no longer looking disinterested. The demos themselves went well with the former, more engaged, stakeholder breezing through their demo and eliciting lots of good questions from the others. The latter stakeholder struggled with their demo, though, as it was apparent that they weren’t so familiar with the interface. We walked them through the second demo and what we found most fascinating was that both of the least engaged stakeholders were significantly more animated and made really good contributions about how they worked and what the system could help them with in order to make their work easier. We were very pleased with how the demo went and it couldn’t have been more of a success, we think. At this point, we are still unsure of what this result means in terms of how we conduct our next few Sprint reviews but we will keep evaluating and improving “Kaizen” style. Do let us know in the comments what other techniques you have employed in your teams to ‘jazz up’ your Sprint reviews. We often talk of conducting stakeholder engagement but more often than not, we simply inundate the stakeholders with lots of information so that we can 'tick the box' on engagement. Your method demonstrates typifies 'engagement' and yielded results. Well played - particularly on making the selection seem random. This is a really useful and creative way of stakeholder engagement and what better way to 'show and tell' by actually demonstrating completed user stories. I have found it useful in the past to inform stakeholders before sprint reviews that they will be actively demonstrating the completed user-story.